San Francisco, CA & Dublin, Ireland; Tuesday, 1st September 2015: In its first calendar month since launch, Windows 10 worldwide usage share far exceeds that of Windows 8 in the same time period, according to independent web analytics company StatCounter. Its analytics arm, StatCounter Global Stats finds that Windows 10 level of usage after one month also exceeds that recorded by Windows 7. "Windows 10 came out of the traps much faster than Windows 8 and also exceeded the launch of Windows 7," commented Aodhan Cullen, CEO, StatCounter. 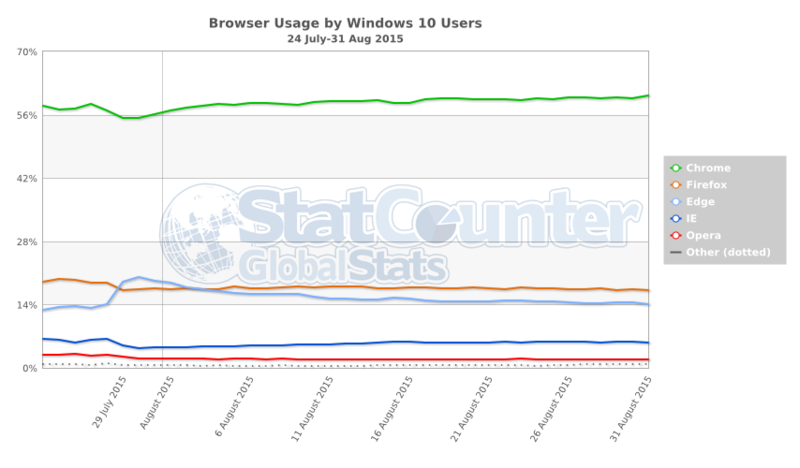 "While it's early days, usage of Edge by Windows 10 users has fallen by six percentage points from its peak the day after the global launch." Worldwide Windows 7 still holds 48.1% of worldwide internet usage share. (39.7% in US and 34.5% in UK). StatCounter's (www.statcounter.com) core business is to provide companies, agencies, bloggers, self-employed and charities with the data to measure activity on their website, blog or forum. Key features include a free option, ease of use, independence and ability to view individual visitors in real time.